I have been having a war with my closet, it has been going on every year for the 13 years we have lived here. We have 2 closets in our Master Bedroom, Honey Bunny got the long one with mirror doors, I chose the walk in one, small walk in one, I have to add. Every spring I start working on the house, as you can see from recent posts I have been doing a lot from painting the garage, cleaning out junk, buying new furniture, it never changes, every spring I go through this nesting phase, HB has gotten so used to it, he never even says one little word, just follows along with my plans. He comes home and says" what's new today dear"? The war of the closet started because I have lots of purses, yes, I am a purse Ho! I admit it! I needed to have a place to store purses, but I am also a sweater Ho, please tell me you fold your sweaters not hang them!!! Oh, the horror of seeing a hung sweater, mercy, mercy on their souls. I needed a place for folded sweaters, that was mandatory. Hmmmm, I have tried everything to make my closet work. This spring the game has changed, with the help of pinterest, I found a solution: A WALL OF SHELVES!!! So simple but it eluded me all these years! I now have baskets for my purses, and scarves and mittens and gloves, I now have hooks for my hats and belts and everyday purses, I have a shoe bag for all my sandals and flip flops, and best of all I have shelves for my shorts and for my sweaters!!! Sound the alarms, ring the bells!! 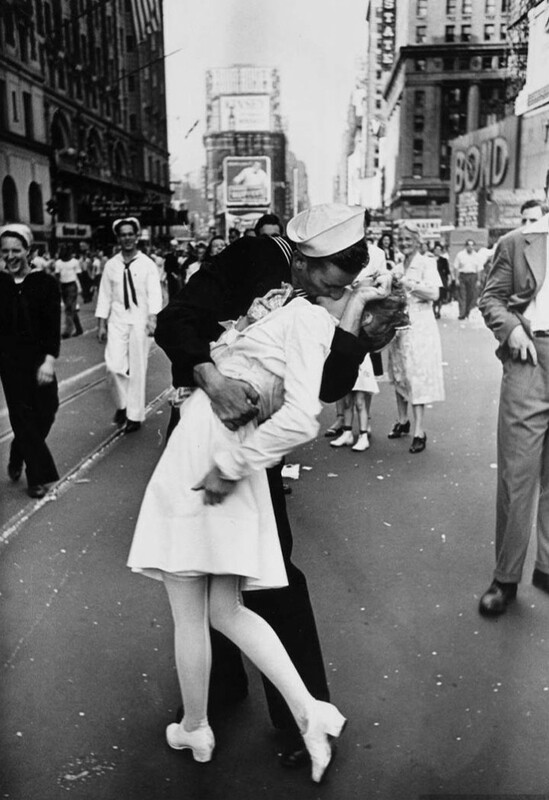 The war is over!!! I win!! Hahahahahaha! Take that you little hole in the wall of a closet!! I win, I win!! A place for everything and everything in it's place, Right side: jeans and pants hung on the bottom rod, shirts and blouses on the top rod. Middle: The new shelves (100.00 in supplies at Lowe's) they hold sweaters, shorts for summer, small shoes and the bottom floor is for boots. Left side: hooks hold all my hats, you have to wear hats in summer in Las Vegas or you will be a leather couch before you know it. My favorite "Tanya" purses hang on the bottom row of hooks. Shoe bag hung on door holds tennis shoes and sandals and flip flops for summer wear! I love my closet now! May peace reign over this room for many years to come!! Hooray!! The war is over!!! I am so happy I could kiss someone!! Nothing says loving like new furniture! I asked for a new couch for my birthday this year, it arrived yesterday! It is so luxurious! Two POWER recliners, no more banging your legs against the foot rest to shut the dang things! Just a push of a button and you can relax a little or a lot, all the way flat for power napping! A console to keep all the remotes caged and to hold drinks! I just love it!! Thank you Honey Bunny!!!! Have you ever ate at Romano's Macaroni Grill?? If you have, you know what I am talking about when I say 'I saw it and had to make it"! I was surfing cooking blogs and came across this copycat recipe and I knew I had all the ingredients, I even got to use a twig of rosemary off my herb plant! Whoo-hoo! 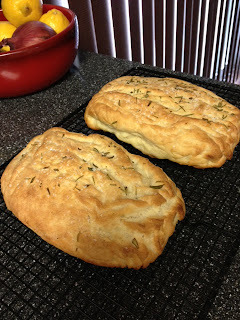 Here is the place I got the recipe, thank you so much for posting this recipe Jen! 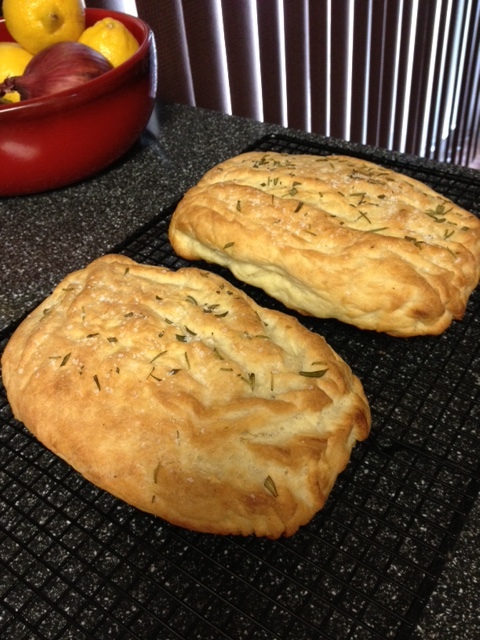 Here are my results, I made two small loaves instead of one large. The way to eat the bread is to slice it and dip in Balsamic vinegar and olive oil with some cracked pepper! This bread was amazing, just like MG's!!! Charlie reads the newspaper and I read the Internet news sitting at the kitchen table having our coffee each morning, today as he was reading, he stops and says "hey, that's our race car!" How fun is that to be featured in the newspaper??!! A picture of our #29 race car advertising the Bullring where they go racing here in Las Vegas! The season starts this Saturday for them, the cars are all fixed up and ready to go! Crock pot meals are perfect for Saturdays! I grabbed this recipe off Tasty Kitchen this morning, it was so easy and I had the ingredients on hand, so I dropped it in the crock pot at 7:30 am and at 4:00pm dinner was on the table. Fabulous! It is adapted from Marie @ The Little Kitchie blog by Amber onto The Tasty Kitchen Site. 1 package chicken tenderloins or breasts, mine were frozen still, no problem, the crock pot defrosts! Place the onions and garlic in the crock pot, top with BBQ sauce and peach preserves, top with chicken and cook for 8 ours on low. While cooking whip up some coleslaw and grab some of those wonderful Hawaiian rolls, they now come in mini sub size, perfect! My coleslaw recipe is: 1 bag coleslaw mix (just cabbage & carrots), 1/2 cup mayo, 1 cap full vinegar, 3 tblsps olive oil, 1/4 cup sugar, 1 tsp onion powder, 1 tsp celery salt, mix and chill. Always perfect! When chicken is done, remove it from the slow cooker along with some of the sauce, and use a fork to shred the chicken. 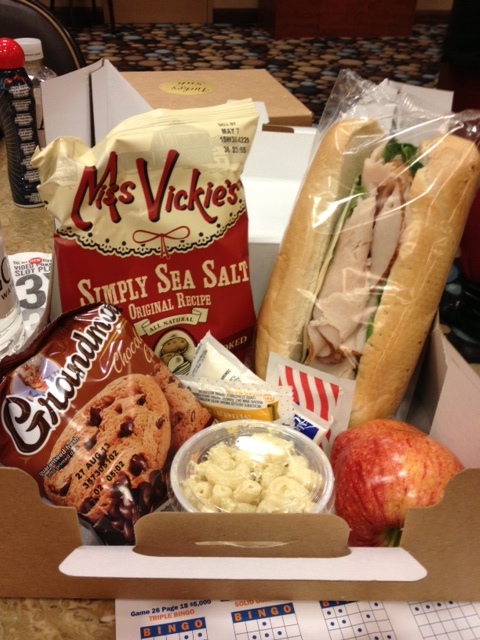 Place on a roll and add some coleslaw! Wonderful! * Amber adds avocado to hers, but I prefer my avocados for breakfast and this sandwich did not need them, the sweet chicken and coleslaw paired great! I have been wanting to grow my own herbs since I started cooking with fresh ingredients, they are so expensive in the store, 3.99 for a bunch and then I only need a little snippet from them and then they sit in the fridge and rot! Ugh! But I do not have a green thumb, my sister can grow the Sistine Chapel from a Lima bean, but not me, I missed that gene from the gene pool of life. But I did a little research and this should work, as long as I remember to water them, they are sitting on my windowsill above where I do the dishes, how can I forget? 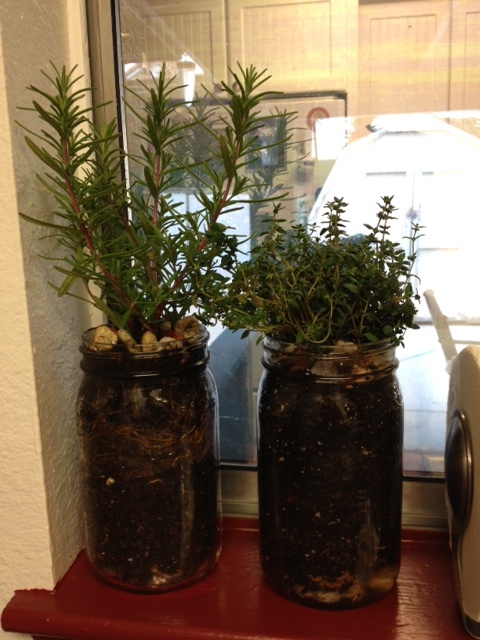 We will see how well I do, keep your fingers crossed for these poor helpless herbs that have fallen under my care! 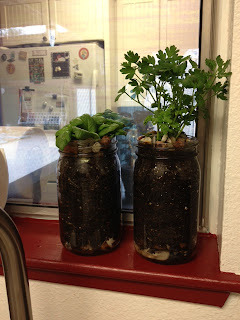 Here is what I did, I bought mason jars, pebbles, soil, and herbs already on there way to growing. Put a layer of rock on the bottom of each jar added some soil and the herbs, then a layer of rock around the top and watered well. 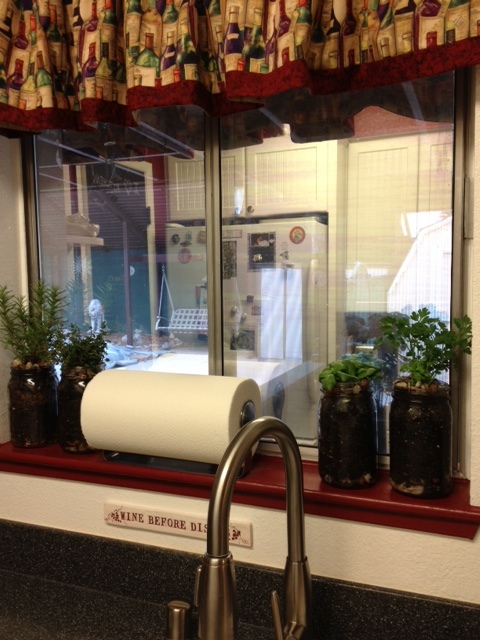 I have Rosemary, Thyme, Basil, Parsley. Birthdays are so much fun! I love to spoil others on their special day, I have always thought birthdays are your one day that is no one else's, unless someone you know shares your birthday! But for the most part it is your day to be treated like a king or queen! Well, I guess others feel the same way and I got treated royally! A new frog prince and Chianti bottle from my sister, Christy. I want to have a collection of Chianti bottles for over the refrigerator. Dishtowels and pot holders made by Tanya. Lots of cards from stamping friends. Pink gloves from Ronna, paperweight and cosmetic bag from Deb. She made me a whole set of solder necklace charms complete with SRV, George Michael, Boy George, the dancing woodstock girl. clovers and violets, even a charm that has a quote by Jim Morrison that says " some of the worst mistakes of my life have been haircuts"! We all know how much I hate to get my hair cut! She also made the rosary chain to hang them on by hand! Stunning! BUT WAIT, THERE"S MORE.....you have to see this purse, my horrible photography does not do this justice, it is amazing, even my husband loves this purse!! 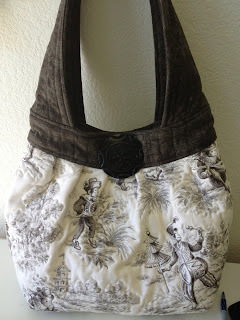 It is made with Monkey fabric!! How "Jackie" is that!!! We all know I love monkeys, but they have to be cute adorable monkeys, with nice faces, these monkeys are fabulous and they are playing music! I love the soft black/gray color...I have not put this purse down!! It will go everywhere with me!! It features a huge vintage coat button for an accent as well!! Last year I took her to see Aerosmith and Cheap Trick for her birthday, so I think she went a little over board for my birthday this year...hmmmm, how do I top Aerosmith for her next birthday, perhaps a phone call to Mr. Robert Plant is in order to set up a private concert??? 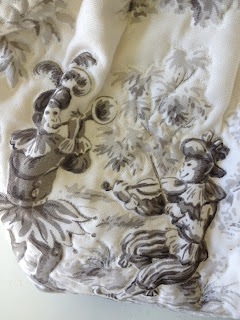 Detail of stitching around the monkeys and plants, that Tanya does on her own sewing machine! My friends, Debbie and Sue came to town to go to the Bingo Tournament at the Station Casinos, being my birthday week, I decided to join in the fun! 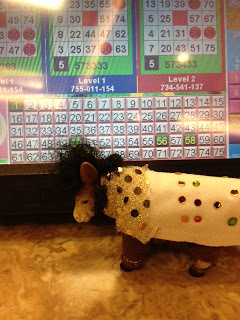 We stayed 2 days at Sunset Station and played bingo from 10am-4pm! The buy in for the bingo was 200.00 but they fed us very well, free breakfast buffets, then they served box lunch, then when bingo let out at 4 we had free dinner buffets! The games started at 500.00 per game for a win and went all the way to 50,000 a win! 2 people won that game and split it for 25,000 each! 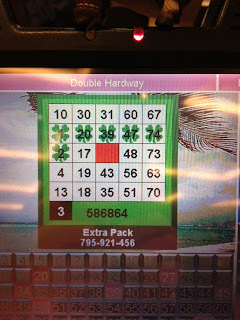 Not too shabby for a game of bingo! It was a lot of fun! I won a 500.00 game. We are hoping they do this again and Deb and Sue will have better luck next time! 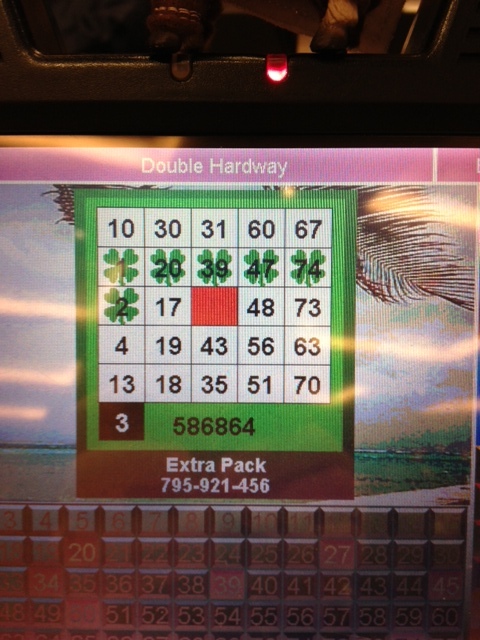 by the time I took the photo it was on to the second game double hardway! 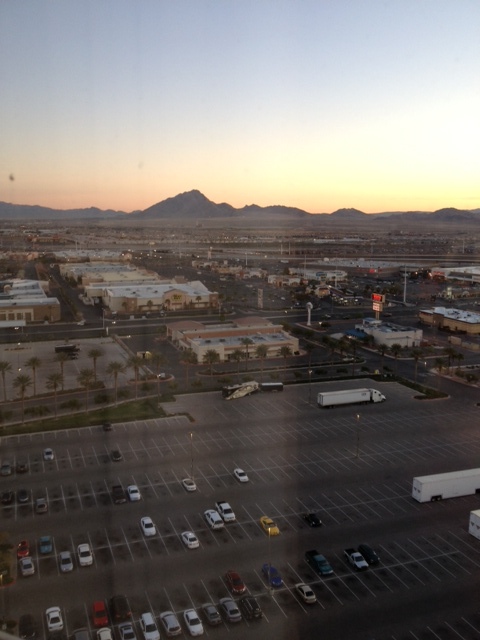 The view from my room, I can see my mountain I live by! I brought "Elvis The Donkey King" with me for luck! Like I said, they fed us well!! 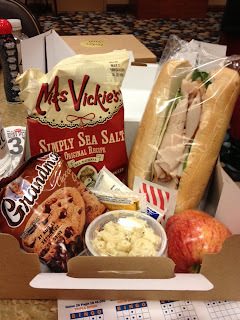 My box lunch! Next post will be all my birthday goodies my friends and family sent me, I am so lucky to have people who shower me with so much love each year! It humbles me and amazes me each year! 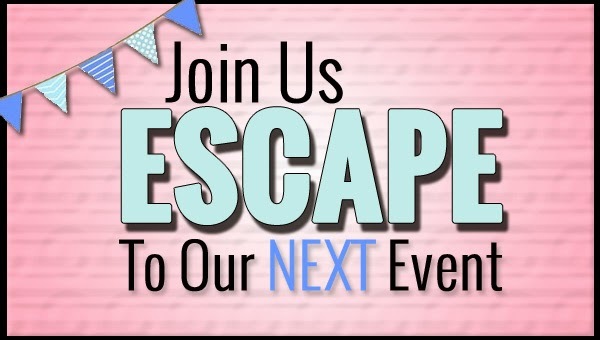 Stay tuned for more fun and frolic in Las Vegas! We had a friend come to town and he won tickets to the Nascar race but he could not go, so for a ride to the airport he gave them to me and Charlie, Thanks Wayne, we had a great time! Friday's qualifing got rained out with the storm that came through so we missed that, Saturday Charlie took Ethan to the nationwide race that happens before the big race, he had fun with grandpa! 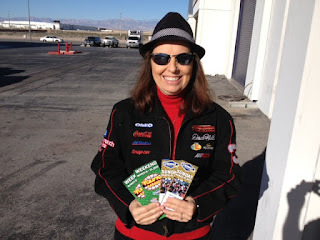 Sunday was my turn, we met up with Chuckie and Donna, headed out early and walked around the neon garage, checking out where they work on the cars. Then we grabbed a bite to eat and found our seats. After the races, we headed back to the raceshop where Chuckie BBQ'd some grub and we sat around and waited until all the people cleared the area out so we could all head home! A funtime was had by all!! It rained really good yesterday, so I got to stay home inside all nice and cozy and cook! I made the copy cat version of Olive Garden's Minestrone soup! It was soooooo good! Some crushed red pepper if you like it spicy! Heat oil in large soup pot, saute onion, celery, garlic, green beans, zucchini, carrots for about 10 minutes until all nice and hot. 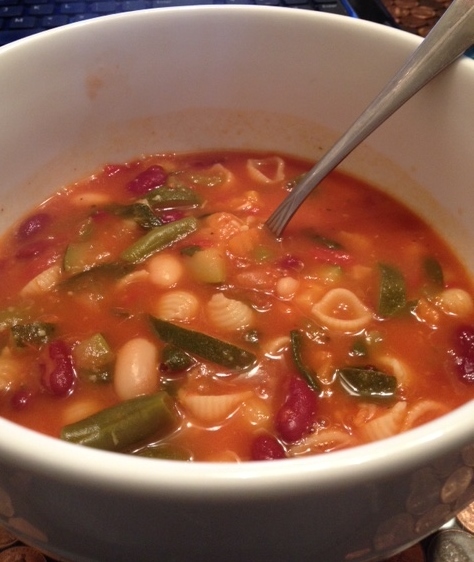 Add broth, tomatoes, beans, pasta, spinach and spices and cheese. Bring to a boil, then cover and simmer for an hour! I have not had a restaurant review in some time, we have just been eating at our favorite places the last year. Claim Jumper, Cheesecake factory, Boulder station Cabo, TGIFridays. That has pretty much been our rotation for Friday nights, oh and Pizza from Angelina's at the corner, I don't know where they get their jalapeno's but they are soooooo hot, I love it!! 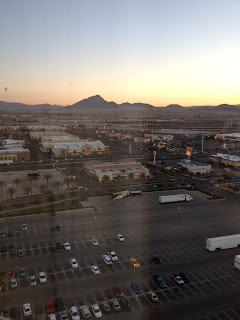 But, we had to venture on to the strip the other night and while there Charlie asked "where should we eat? ", hmmm, so many choices...Maggiano's, Margaritaville, but my favorite places to eat are actually coffee shops in casinos! I love them, something about the atmosphere in those places, the clanking of the coffee cups, the people to watch, some look like they have been up all night, some have just arrived to Vegas and have that money burning a hole in their pocket look! It is an exciting vibe, one of the reasons I love living here! The people watching is the best! We decided on The Grand Lux Cafe in The Venetian. One of our favorites, the food is fabulous and if you are lucky you get a table on the inside patio to watch all the tourists walk by! We got our patio table and ordered, Charlie had the chicken parmesan and I chose the crispy caramel chicken with rice. Wow, it was delicious! I may have to try a recipe for that here at home! So there you have it, a fun place to go when you are on the strip, make sure you eat at The Grand Lux Cafe in the Venetian, you will be glad you did! 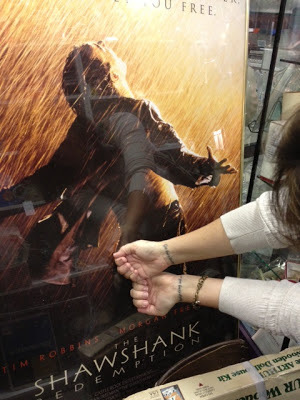 My tattoos come from the movie The Shawshank Redemption. I was out antiquing with my friend, Tanya, we came across this movie poster and I could not resist! I also came across a Brighton bracelet for 20.00, and it turned out to be one of the Breast Cancer bracelets that are limited edition, a 2004 Bracelet! Great find there! I cleaned and painted the garage! I figured now that I have the treadmill out there I want it to look nice! I picked a pretty blue, hung a Hawaii poster, put in a huge storage shelf for gatorade and water and all the bulk items, painted my hubby's side cabinets with chalkboard paint so he can write notes on those instead of the wall, made a little racing tribute wall for him with his racing plaques and awards.....Whew! It took me about 3 days of work but it is so nice to do my workouts out there now! I am doing 30 minute 300 calorie burn 2 times a day! My motto for the year "just keep moving"! Oh I finally had the chance to go see where my friend Colleen Myler started working, and boy, was it amazing! 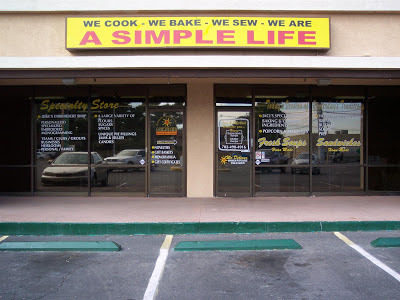 She works at A Simple Life, www.asimplelifelasvegas.com a place to buy gourmet type foods and mixes and so much more! All the info is on the link there. You can pop in for lunch, they have soups in soup crocks cooking away, I sampled the split pea and was in heaven!! 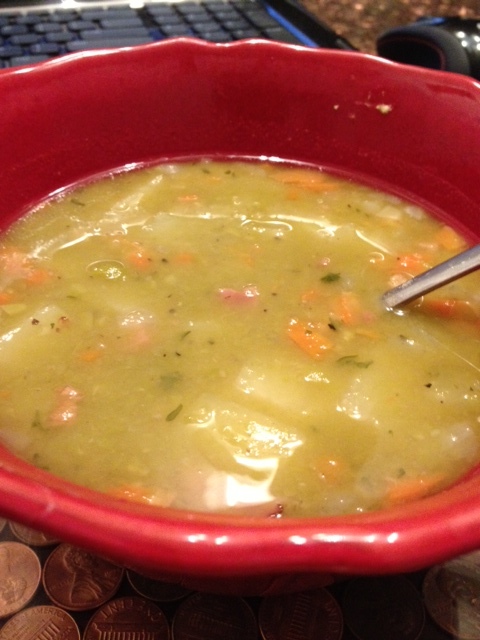 Hard to get good split pea that does not taste like a can. This one is totally homemade and then after you eat it you can buy the kit to make it at home!! They have kits to make tons of soups, gourmet popcorns and so much more. 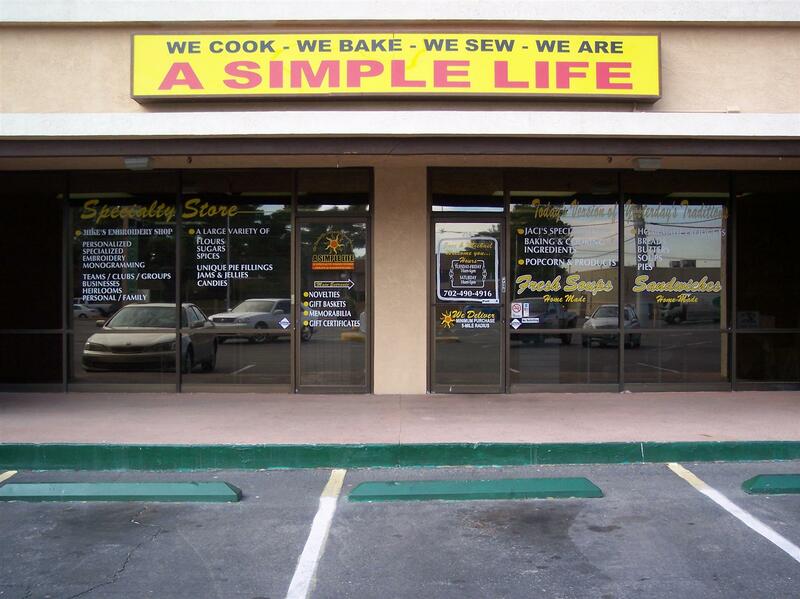 They also have tons of gluten free items so if you live in Las Vegas get over there and get some gluten free! A whole wall has jams and jellies and sauces, Oh My! 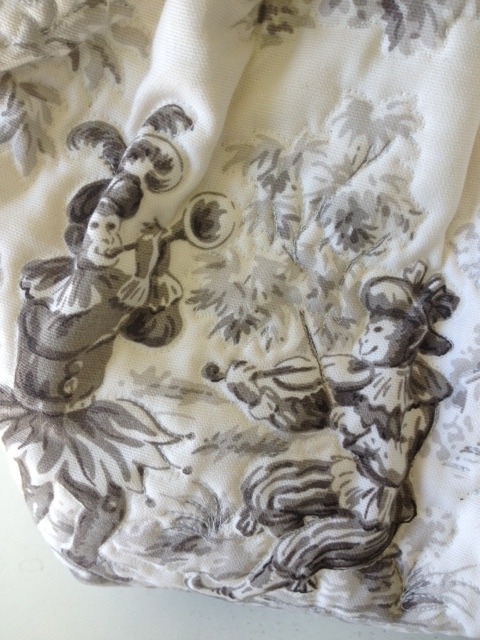 and if that is not enough the husband does custom embroidery!! You can get a sandwich and a slice of homemade pie, I tell you this place has everything!! I even found a jar of Gee!! That is the butter you dip your crab legs in, I can't wait to go buy some of that when I make crab legs again! Oh, they also have mixed butters like horseradish and chive to put on your baked potato, I was going to buy that but forgot! I already had my arms overflowing with goodies! I can't wait to go back and see my friend and buy more goodies! I bought the kit to make split pea soup, I added 1 potato, 1 carrot, some onion and chicken broth instead of water, it was drop dead fabulous!!! Charlie hates peas so knowing he would not be home for dinner I had it all to myself: can you say YUM!! I love the guitar, I love to watch people play, anyone from Stevie Ray Vaughan (my idol) to Esteban (classical guitar) to rock gods like Joe Perry (Aerosmith). My mom would play the guitar, she was self taught on acoustic. It always amazed me that my mom could play, I wish she would have taught me before she died, but she had no patience for that or us kids in general, we tried a couple times but it never panned out. So I vowed one day I would learn to play. Somehow, Someway. I got the chance to see Esteban, my mother used to talk about him and had always wanted to see him play, she loved to watch dance shows on TV and LOVED Flamenco. Esteban is trained in Flamenco guitar playing. She said he was a beautiful guitar player. She was sure right about that! I was mesmerized, he played everything from the first music ever written to Runaway by Del Shannon. And he had his daughter with him who plays violin and dances to the music, she was gorgeous and very talented too!! This was a wonderful, beautiful, amazing show, run right now and get tickets! You will not be disappointed!! !